This home comfortably sleeps 12/14 people. There are 2 master bedrooms suites. This home is located in Watersong, a gated community that includes a clubhouse, white sand volleyball court, community pool, fitness room, cyber cafe, large gathering room, and children's playground. We are just a mile away from the nearest golf course, a 20-minute drive to the Orlando theme park attractions, and several fishing areas nearby. Upstairs in the huge den, there is a comfy sitting area where you can relax or play some pool in an air-conditioned area. 2 master bedrooms with king-size & queen beds. 2 bedrooms with twin beds. 1 kids bedroom with 2 bunk beds (sleeps 4). 1 kingsize sleeper sofa in the den. All rooms have fine quality linens, cable TV, clock/radio and walk-in closet. Outside in the large pool area you will find many chairs & loungers so you can enjoy the Florida sunshine or have a lovely relax in the evening after a day at the parks. Also a safety fence to keep your childeren safe. 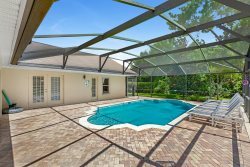 This property boasts of the following; Pool and spa, Well appointed kitchen, Game room with air hockey, ping pong/tennis table & dart board, Family room, Dining room, Breakfast nook, Huge den, Wireless internet, Printer, Cable TV, Hair Dryers, Cot & high chair, Iron & ironing board and Washer & dryer.